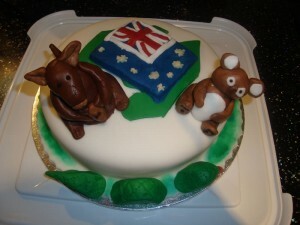 I was asked to create a cake in an Australia theme recently this is what I came up with. I made a standard chocolate sponge cake and iced it with a plain white icing. I then created an edible Kangaroo and Koala Bear to sit on top along with a snake going around the front. On top I also created an edible Australian flag which sat on a green icing cut out of the outline of Australia. Click the image “down under” for a larger picture of the cake. Mix the egg with the flour and and then stick the Kangaroo in and mix all together until a Koala bear and snake wander into the kitchen and get in the bowl too.